Nicole got a boat for her birthday. A rotting Dynamique 50 sloop, junked up and in terrible shape. Okay -- "got" isn't exactly the right word -- it came to us on its own. 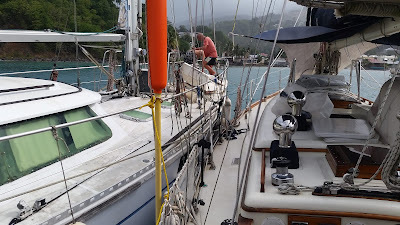 In the calm evening of Nicole's 14th birthday we were sitting comfortably on a public mooring ball in Deshaies, Guadeloupe. Just finishing the dinner dishes, we were readying for friends from Proud Mary to join us for cake. Always in tune with our surroundings, Greg never stops listening or watching for signs of trouble. But sometimes it's as though he has a sixth sense. There was little wind and no signs of trouble when he stuck his head out the hatch to look around. 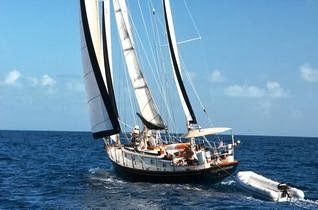 And there she was - Mangaia, a 50' sloop, broadside, a half boat-length away, drifting down on our bow, mooring ball in tow. (From her looks, she had been sitting unmaintained on her mooring quite a while.) A quick call of "all hands," and the rest of us were up on deck with him. Greg and Cash jumped into the dinghy while Nicole and I grabbed fenders. Pushing with the dinghy, they maneuvered Mangaia past our boat and off to our port side. she would drift out to sea. Greg wasn't willing to let either happen. 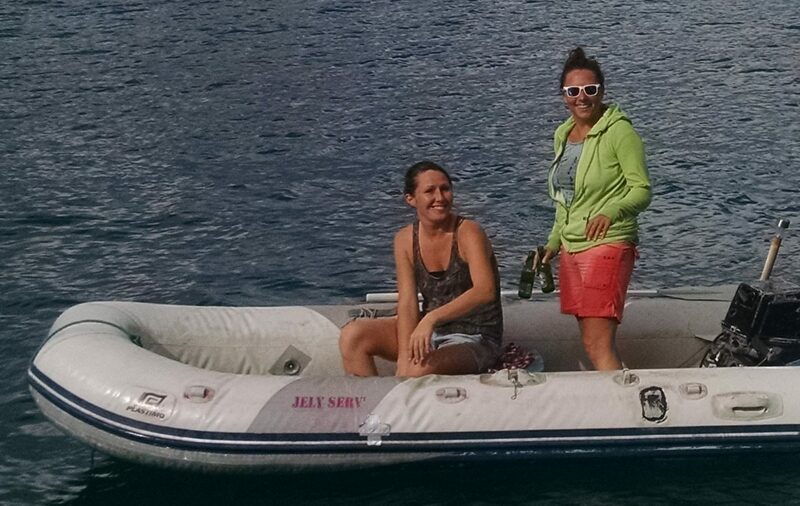 We radioed Proud Mary, who arrived shortly in their dinghy. Together, they pushed her to the port side of Daystar and tied her alongside. Wow -- we've got a new boat -- just in time for Nicole's birthday! Again: now what? A call to the French Coast Guard proved fruitless. Since no person was in danger, they were not interested in coming to assist. 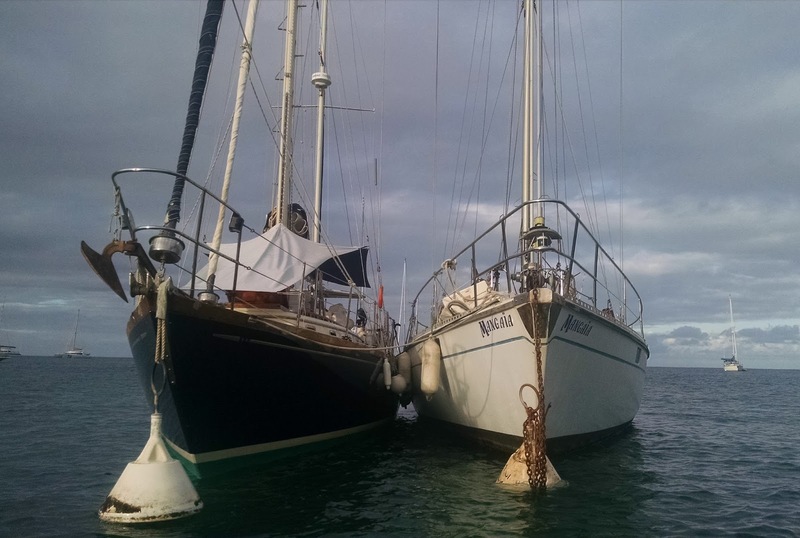 Their only suggestion - that we move Mangaia to another mooring - was not possible. All moorings were taken, and it would have been difficult to move the boat in the dark of night with just two dinghies. We would have to babysit her until morning. This is NOT what you want to see when you look out your galley portal. Tying a boat to one's own isn't as straightforward as it might sound. 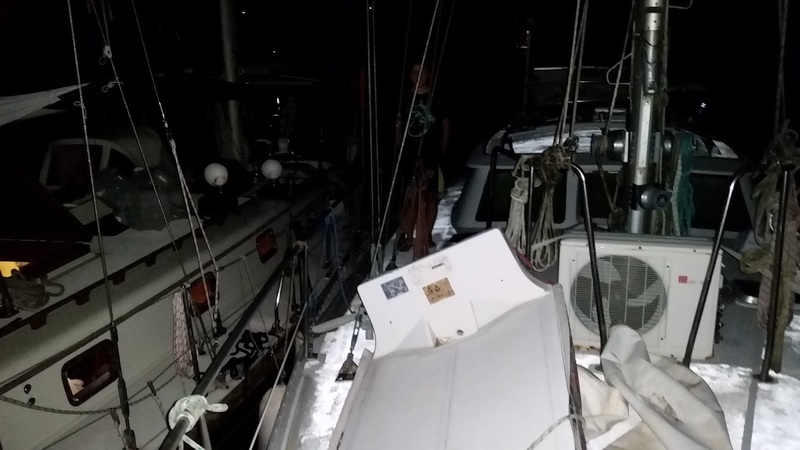 The movement of each boat in the water could cause damage to the hulls or rigging. The swell was predicted to increase to 5' in the next two hours. 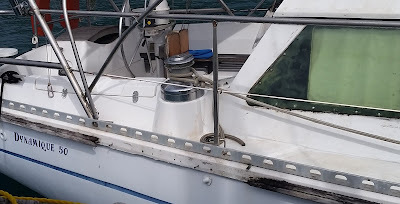 Plus, in light of recent events, we were not filled with confidence that our mooring ball would be strong enough to hold the weight of both boats. Greg was up all night, adjusting lines and checking on every sound. In the morning: now what? 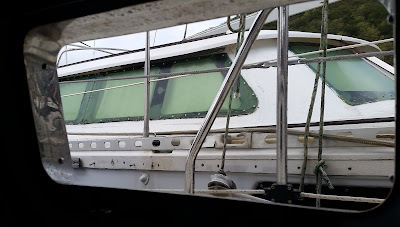 At first light we prepared to go ashore, hoping to find someone who could help us find the owner. 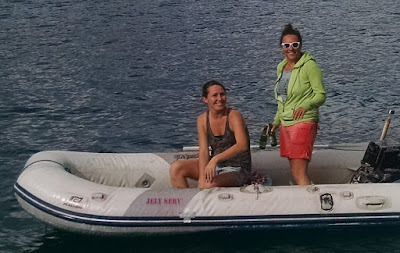 As luck would have it, the two women of Jely Serve, a local business, came by in their morning rounds with a dinghy full of baguettes, pastries and fruit to sell. (Love the French islands!) 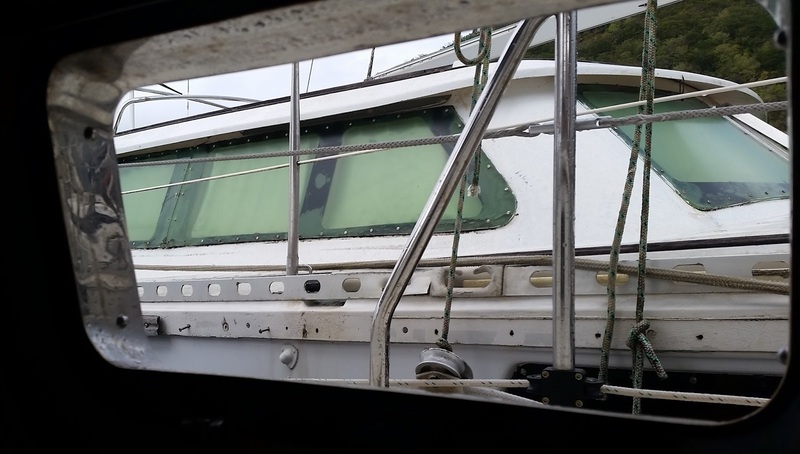 They knew the boat, and immediately put in a call to the owner. Mangaia's owner on foredeck. Not sure what he was doing, but it took hours. When Mangaia's owner arrived, the Jely Serve ladies got him on board. Attempts to start the engine were unsuccessful, even after the purchase and installation of a new starting battery. The only solution was to move her by dinghy-assist. A private mooring ball on the opposite side of the harbor was free, and we brought together a contingent of four dinghies to help get her there. Haha! Yes, sometimes there is no sleep at anchor or mooring. Paula used to wake up when our kids would cry. I would sleep through that, but I wake up when the wind or sea state changes. Thanks for the comment!! Nice save! 5' swells in the mooring field though? Yikes! Thanks, Elisa! It wasn't actually 5' in the anchorage, but it was bumpy. It was 5' outside and it was from the N, so some of it wrapped around into the W facing harbor. But also, due to the topography of Guadeloupe, Deshaies gets shrieking blasts of wind far higher than ambient. There have been times there that we felt like a duck in a shooting gallery due to boats dragging past.